﻿ Mirai fruits | TECHXCEL JAPAN CO., LTD.
Mirai fruits are made from 100% fresh fruit particularly harvested in season. Using the freeze-drying processing, Mirai fruits retain plenty of fiber and nutrient from original fruit, it has soft and powdery texture but tastes just like fresh fruit. Mirai fruits are recommended from kids to elderly! What is the Freeze dried fruit? What is the different with dehydrated fruit? Most types of dehydrated fruit are made from sliced fruit naturally removed moisture with added salt, sugar or preservatives. On the other hand, freeze dried fruit are freezing the water content on fruit and dehydrated without any preservatives. It doesn’t destroy the structure of fruit and retains plenty of fiber and nutrient from original fruit. That’s why Mirai fruits can keep the flavor, color and taste as fresh fruit with powdery texture while dehydrated fruit are usually withered and harder. For these reasons, Mirai fruits can’t be compared to the most of dehydrated fruit. Enjoy a tea time with Mirai fruits! Mirai fruits are perfect for a tea time! It is a delicious and healthy snack with cute shape! Place Mirai fruits in your favorite tableware and enjoy a tea time!! 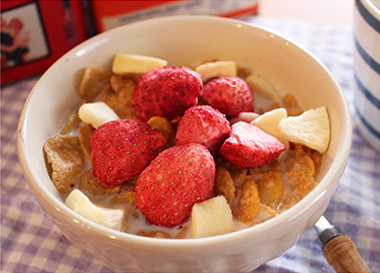 Let’s have a breakfast with Mirai fruits! Upgrade healthy and plenty of nutrition for breakfast! 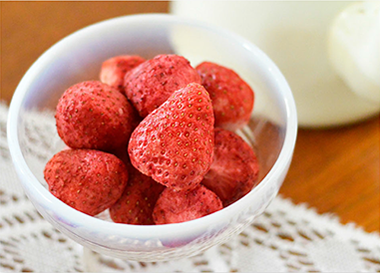 Mirai fruits provide highly nutritious and delicious meal simply adding milk or put in your morning cereal! 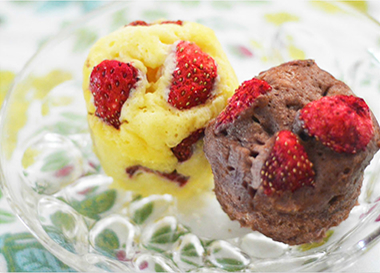 Let`s cook desserts with Mirai fruits!! Add Mirai fruits for bakery recipe. It provides high level of handmade bakery! Storage: Please avoid direct sunlight, high temperature or humidity. Mirai fruits are made in the same factory which produces products with bananas, apples and strawberries. Please pay attention who has allergic to those fruit. We use fresh fruit as it is. As the result, each piece of Mirai fruits have different shape, color and taste. White powder may be found on Mirai fruits which is from the progress. It is safe to eat. Mirai fruits are easy to go bad once a package is opened. We recommend to consume immediately after opening. Shelf life: Printed on the bottom of package.